I guess I am really ready for 4th of July in this outfit! July means that I am officially on Summer Break! Cannot wait to have a few weeks off before the new school year starts! Linking up with Mix and Match Fashion and vodkainfusedlemonade today! Beautiful outfit! It looks like we live in the same neighborhood too. I'm so glad you stopped by today. I can't find your email address listed on your blog. Definitely send it to me (economyofstyle at gmail dot com). I would love to add you to our growing group of St. Louis Fashion Bloggers. Love this look. Stripes and red gorgeous combination. Thanks for stopping by. Please link up. Cute look! I have this top too in the teal/combo. Super loving your arm party! Thank you so much! I love this top! I was so lucky to find it! I got it SUPER on sale! This top was under $10.00! Love when that happens! You don't get summer break until July? I thought we were late to the summer break party because we got out on June 13th! I love your patriotic look! Thank you! Summer break technically started after Memorial Day, however I am teaching summer school! Summer school started as soon as we went on break. I go back for the next school Aug 1! Crazy! Way to rock the red/white/blue and still look classy! Love this look! Thank you! I love this combo! 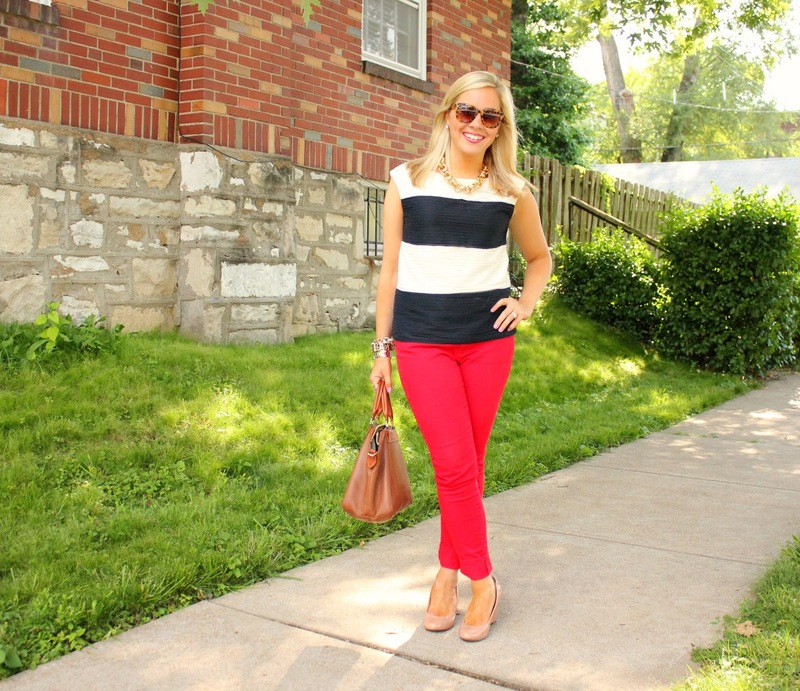 I totally love anything nautical, and your leopard bracelet is so pretty!